I'm too far away like you Wendy, but I have a few friends in Florida and I will forwarding your request. Why do these things keep happening in America the supposedly wealthiest nation?!?! i have emailed a friend in Florida who might be able to offer some advice on any organisations that can help Monica, somehow i don't think a petition & emailing a greedy landlord will do anything!! Family Emergency Services is a non-profit agency providing food, prescriptions, rent, utilities, and holiday assistance to indigent families in the Greater Winter Haven area.Eligibility: Economic problems. "Great community programs for the homeless..."
I hope Monica can get help with this. That's horrible to be put out on the streets. Has she no family she could ask for help? So sorry to hear this. Also, so sorry for your loss of your beloved cat, Zeus, Monica. God Bless you. Unfortunately, homelessness is rampant all over the world, NOT just in the USA. Signed and Shared. Thanks for creating the petition and forwarding it, Wendy. Also, Angela, thanks for forwarding. Noted and signed. Thank you Wendy. another sad direction the world is going in . there is so much waste by the 'government ' and the people we elect to represent us . many of these people began a 'personal' wealth and money grab as soon as they are able to access it . I am disgusted . I haven't been able to sign Care2 petitions for two days now, so I am unable to sign. If Eric fixes the problem, I will sign as soon as I can, although I agree with many above that a petition to a greedy and heartless landlord who has already evicted her and left her homeless is probably pointless, but worth a shot. However, I will send an email to the address provided in the petition. Please send her my most heartfelt sympathy for the loss of her baby. This is so tragic. I wish I could do more. Noted and signed. I pray Monica, you receive the help needed for you. PLEASE MAKE A HOME ACT, AND/ A HOMESTEAD ACT INCLUDED with no obligations accept that people have available the help and encouragement to improve their lives, and when ready to give forward the say that they would choose. The USA has had a low number of jobs(just over broke) and Jubs (just under broke) so many people with injuries or health problems and healthy people got zero jobs and some people go no jobs, not to mention professions so the creation of Homesteads, homes, apartments, boats, ships, for would be wonderful, and a good thing to do. ( I say this having observed this homelessness across the country in many places. Hope people will help almost every person to have a home of their choice when they need one. Shelters need to be more like separate homes and separate apartments, and separate dorms depending on the person. Shelters are not good for many people, so most people avoid them, so they stay healthy. Please consider to do a fundraiser to form communities so people in this kind of situation can go have a home, and if they want to a garden, or raise their own food. The gardens can be community gardens and they can be separate gardens, same with the livestock and the livestock could be in separate sheds, due to keeping diseases from spreading. OTHER PEOPLE HAVE DONE THIS YEARS AGO, SO PLEASE LET'S DO THIS STARTING NOW. IT CAN BE DONE WITH FUNDRAISERS AND THE PEOPLE WHO ARE WILLING TO PARTICIPATE, AND GOOD SUPPORT GROUPS. WE HELP ANIMALS, WE CAN HELP PEOPLE. 1. ( one request) Please, dear man or woman out there who is good at fundraising do a fundraiser on social media where effective to help this lady. This is not unusual and we could help many people. I will do my part as long as I can to share the info. ( 2. ) second request. Sunday, March 24, 2019, 10:59 am MANY PEOPLE WOULD DO BETTER FOR THEMSELVES AND FOR ALL OF US WITH A HOME TO GO TO. For some people, it is a mistake to rent because people are pouring their money down the drain. Shelters make them into bought up apartments, homes, land that people have a choice to live on with at least 3 supportive communities to bring people up and not down. Please make sure that she is given if needed, a separate room in a shelter, and separate bathroom room use time so she can get better. Or, please will some person give her a room with a separate entrance or a separate cabin to stay in. With fundraising, many things can be done. signed tweeted posted on all timelines requesting help if able. ty Wendy Do she have a Gofundme account? Action completed. 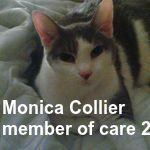 We are all morally obligated to help Monica Collier. That's what Care2 is all about. What more can I do? Please advise. and thank you for sharing. E-mailed housing authority Winter Haven FL. I have sent my email and have asked why a system that we have here in the UK, - paying rent directly to the landlord from benefits, cannot be put in place, this avoids the crisis situation , Monica faces now= living on the street. it happens globally, people fall through the net due to lack of compassion, & people not caring enough to do a good job. - looking after the vulnerable. because all too soon those living on the street become invisible, not if i can help it!!!! S&S on FB! We MUST gather MORE SIGNATURES!! TY wendy k for a link that finally worked. Signed with HOPE for Monica. I don't know Monica personally nor in my friends list but I remember sending her stars some time ago. Anyway if she can manage to come to my country, I am poor but with me she will surely have accommodation. She doesn't have to work for me, just help me take care of my babies (they are a bit handful though :)). She can stay with me as long as she wants. If she likes my offer, please simply contact me. noted & signed. So sorry to hear about Zeus passing away. Hope & pray you find the help you need. Thanks Millie for your help. Gladly signed. Thank you so much, Wendy! Signed sweetie. Thanks so much for sharing dear Wendy ! The link did not work, Wendy. I copied and pasted into my browser and that did the trick!Petition signed and noted the posting.Thanks for your caring heart......................... Big Hug! Signed, shared and noted. Thank you for sharing this Wendy!!! thank you Wendy - signed, noted and shared. Signed and noted and also emailed the housing organisation. My thanks to all who have signed and written, thank you all for your caring and compassion.....in great need in this world. Sorry I'm just getting to this. Perhaps by now her situation has been resolved in a better way. As Florida goes by County and she would be in a different County than I - it appears Millie has pulled up the information that offers assistance in Monica's area. I have posted stories in the past of Elders with health issues being tossed out on the streets in Florida. There is no protection for any renter no matter the age in this State. I'm facing the same thing myself of trying to find an affordable place as a new Corporate landlord bought these apartments and is jumping up on the rent to almost $400 EXTRA per month. No improvements just increasing the rent and that goes beyond my limited means as also an Elder on a fixed income. I wish there was more to offer but I'm facing this problem myself soon once my lease runs out. We need to have affordable housing and there isn't enough of it to go around. Appears she may have already been in affordable housing - so if she still can not pay that then I'm not sure what can be done. Agencies such as churches will help for a month or two until she can find something else. I'm on a waiting list for affordable housing but that can be a year to year and half wait - I'm looking at a couple months at best when lease runs out. God help us all. It is only growing worse for many people. Thanks dear Wendy for doing this,signed & emailed. Thanks Wendy, - I just received this request and of course signed with hope in my heart that those in FL discover a way to make Monica's life better. It is becoming a social crisis across our nation, that those without financial wealth are being treated without conscience. Your work here is commendable Wendy, and I thank you for bringing this sad situation to our attention. I have been offline but just signed the petition. What has our country come to when we put money before people?! I'm praying Monica can find safe shelter quickly. I;m praying for Monica, that is just so sad. Signed and noted, thank you Wendy.. I don't know Monica. My heart goes out to her. Signed and noted. Noted and signed previously. Thank you Wendy! Noted and signed. Many thanks for sharing. What a heartbreaking situation, yet so heartwarming that so many people care. Let's hope that Monica and others are able to find something suitable soon. I just want to say thank you to all that have stepped up and signed this petition for Monica. However, I must also say that I am very disappointed that, out of the thousands of Care2 members, only 230 have signed. Monica desperately needs our help and I hoped that more would have signed. My dear friend Sheryl has responded, many thanx to her! i never received anything in response to the email i sent to the landlord! Tax cuts to the 1% & welfare cuts to the most needy!!! You must get rid of him, i'm doing my bit promoting the Bernie Sanders team over on Twitter!! Thank you Wendy for all this love and care. Signed previosly. Sending prayers for Monica. Petition signed! God bless Monica and provide accordingly to her needs! Thanks Wendy! Monica is back on the Street, but without anyone in her corner in Florida, ??? let Monica help with the paperwork side of a business, ? , or can anyone else come up with an idea, to help Monica, ? It should be illegal to let landlords put senior, vulnerable, ill, lone females/ males onto the street !!! How extremely sad! What kind of world are we living in? This should not happen anywhere. So sad, any updates? Thank you. Just got this from Melania Sadly March was when I was off Care2 messages and I feel so sad, looked at the petition and it was closed....Couldn't see if it got the needed signatures and kinda rushed through the end of the comments tried ~ What is her Avitar? can you copy past on my page also is there a FUND ME PAGE for her? Just a question. Sorry, my eyes are wet, while I care I missed this taking care of my Mother, but I understand loss of your best friend then home. Gotta wipe my eyes! Night for now, will track! Signed and shared on March 27, 2019. As Melania P asked, are there any updates on Monica's situation?